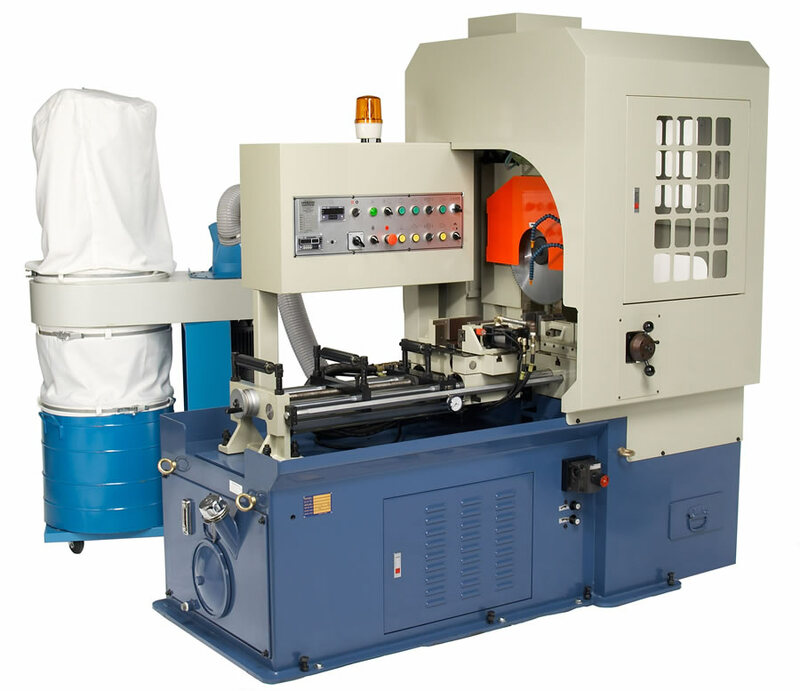 We designed this automatic cold saw to make large volumes of ripple-free cuts in non-ferrous material, like aluminum. A 3,630-pound steel frame ensures a long lifetime of accuracy. Runs at 3,200 rpm to cut soft metals. Accepts up to an 18” blade. 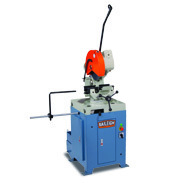 Non-mitering column head gives you a true 90° on every cut. 5 hp motor turns blade through its gear-driven head and runs on on 220 volt 3-phase power. 3 hp motor powers the industrial-grade hydraulic system, which controls the vise and the blade gap compensation device. 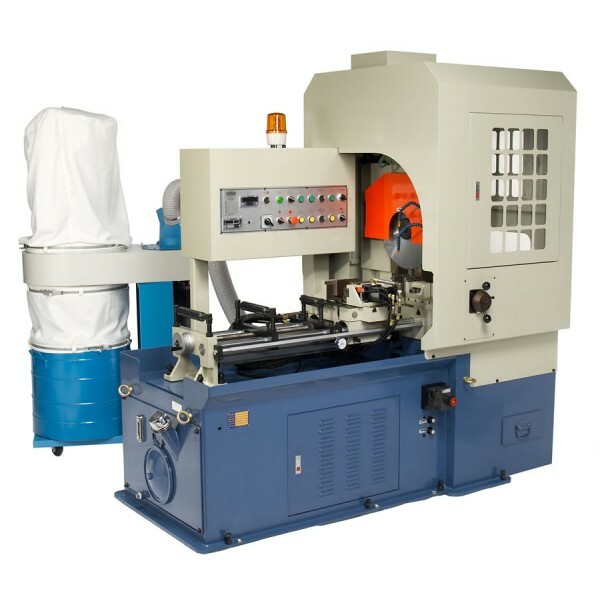 Automatic material feeding, vise clamping, and cutting make the operator’s job easy. Just set the length and number of pieces you want, put the material down, and walk away! Simple control panel lets you determine the cut length and manage the automatic feeding system with a series of switches and dials. Set the blade descent rate, retract rate, and coolant rate through the control panel. Material feed system includes a floating vise that you can adjust in almost any way imaginable. 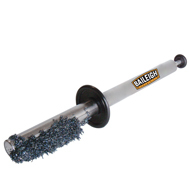 Mighty hydraulic vise can push or pull over a ton of material. Vise allows for a maximum cut length of 77”, achieved through 3 strokes. Dial indicator for vise pressure and speed allows you to check that the vise is working. 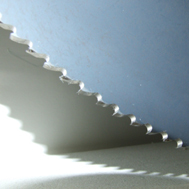 Saw automatically makes a face cut to give you a clean first edge. Pullout drawer under the saw catches small parts and debris. Built-in dust collector with internal vacuum removes aluminum particles from the air. Flood coolant system helps to extend blade life and make high-quality cuts. Designed for convenient maintenance. Slide the pump, cylinders, and reservoir out on a drawer to change the hydraulic fluid. Warning light on top starts flashing to alert you if the saw detects a safety problem. We stock replacement parts at our Wisconsin headquarters for fast shipping. This circular saw comes with lifetime technical support by phone from our team of reps, all with hands-on machine experience. Recommended for: Making aluminum parts for the aeronautical, nuclear, shipbuilding, boilermaking, or medical industries.